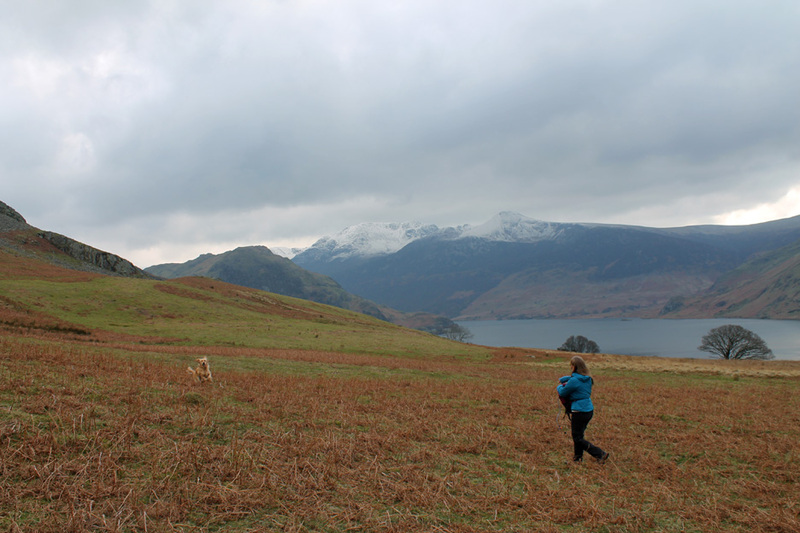 " Cold Grasmoor with Jenna and Dylan "
Location of Start : Roadside near Lanthwaite Green, Crummock, Cumbria, Uk. 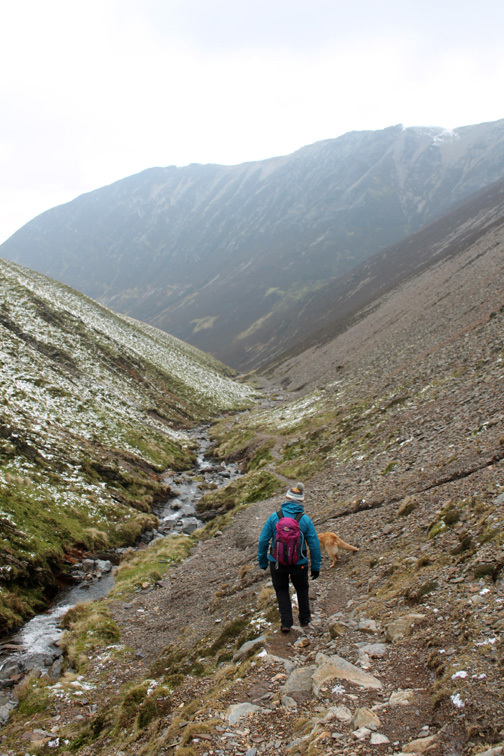 Places visited : Cinderdale Beck, Lad Hows, Grasmoor, Coledale Hause, Gasgale Gill. Walk details : 6.3 mls, 2635 feet of ascent, 3 hour 30 mins. Walked with : Jenna and Dylan. Weather : Overcast with fast moving clouds, a wintry shower and some patches of blue sky. It was a steep climb up Lad Hows . 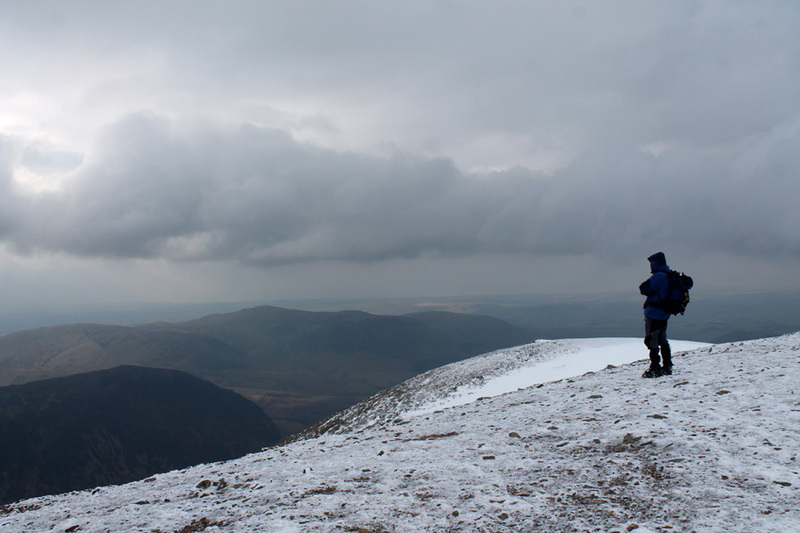 . .
but you gain height quickly to the summit of Grasmoor and on a day like this you enter into another world. 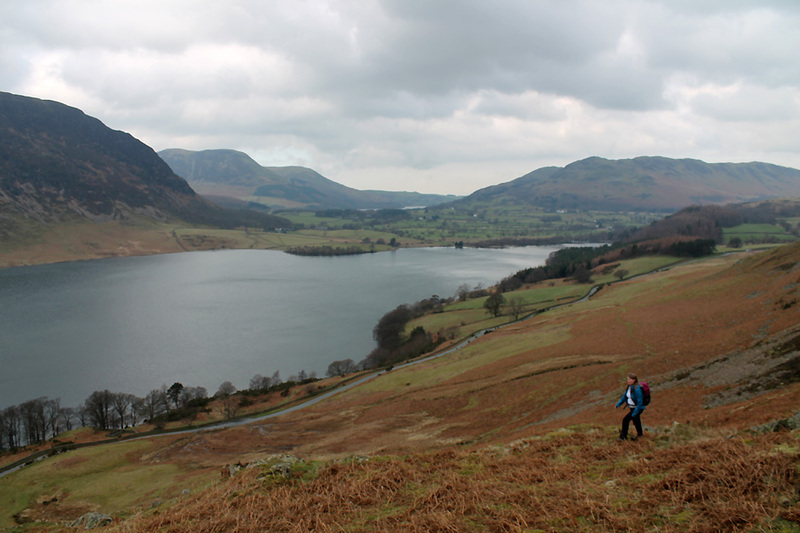 This round walk, starting and ending at Lanthwaite Green, will be full of adventure and surprises. The walk started today just beyond the normal parking area at Lanthwaite Green but still on the higher ground before the Lake. Hopefully we could maintain the height and gain access to Lad Hows without climbing all the way up from Cinderdale. and when they open and let the sun's rays through the effect is spectacular. 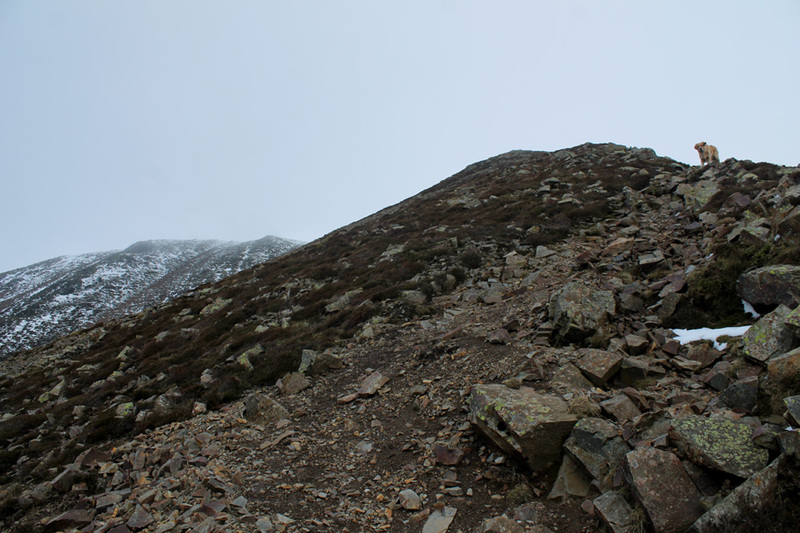 Our plan has worked and we maintain the height we gained by climbing Fall Crag below the main face of Grasmoor. 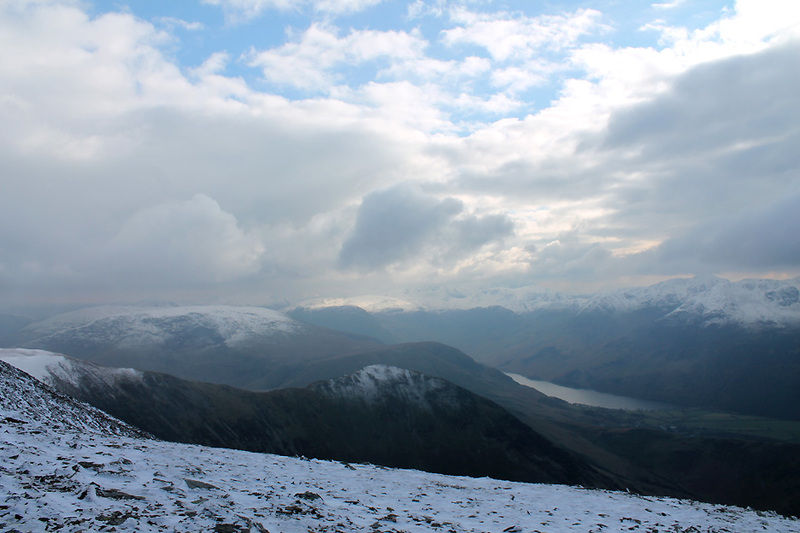 Looking up the valley over Rannerdale Knotts to the snow on Great Gable and the high fells. Upper Cinderdale Beck crossing . . . not a great problem. The holly tree high above Cinderdale car park below. 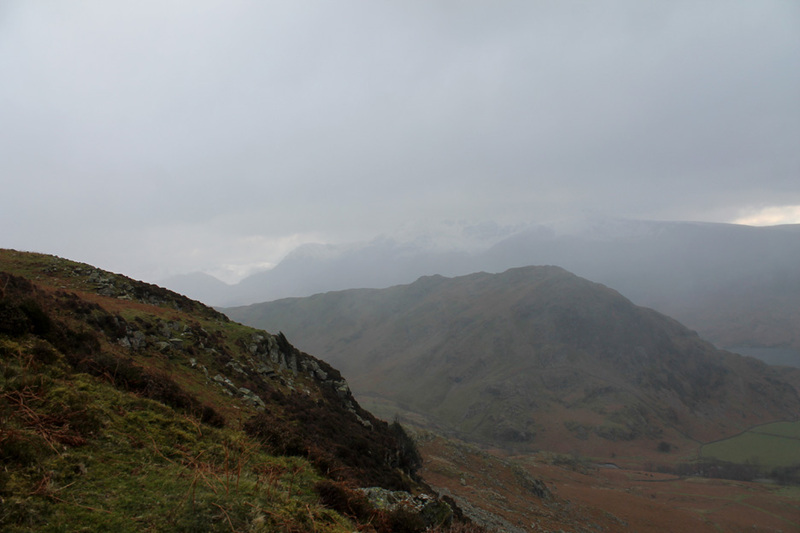 We've lost the view of Great Gable as a wintery shower rolls in. It would be a damp drizzle on other occasions, but with today's low temperatures it has turned to light hail . . .
. . . but before long the cloud parted and the blue skies offered the promise of better weather. 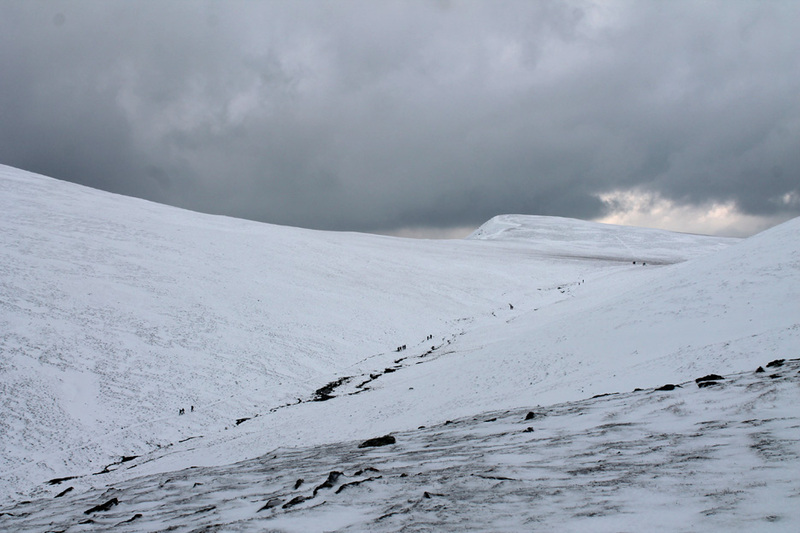 Whiteless Edge fails to live up to its name today . . . but that means there should be good snow on the top. but by picking your route well through the rocks and stones you can make life a little easier. As the slope eases the snow starts and we are officially above the snow line. 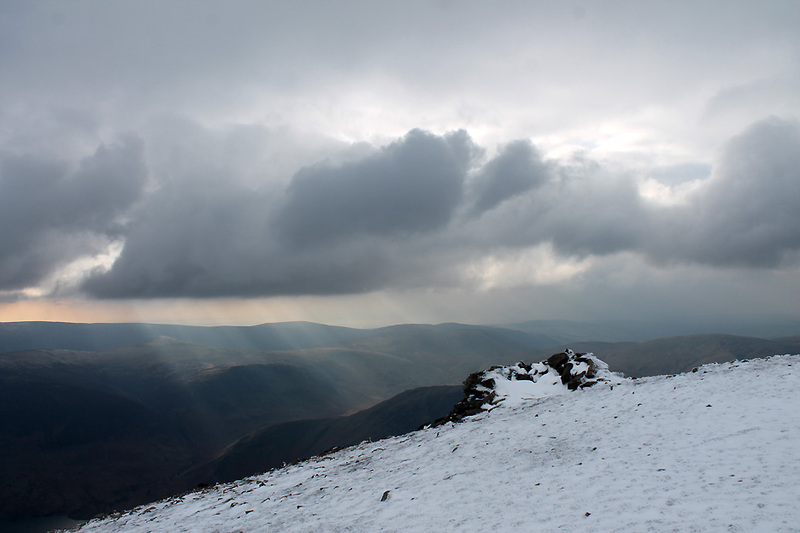 With the exposure of the top of the ridge we are exposed to the northerly wind . . . as Dylan can testify. Jenna is trying out her new Rab Vapourise Lite jacket . . . which so far is proving very effective. 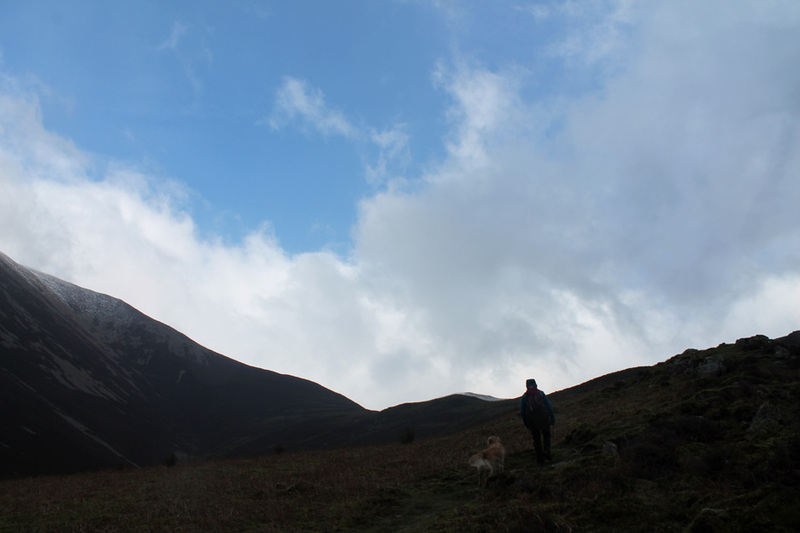 The last steep climb to the summit ridge . . . and with the benefit of deeper snow the going is easy. The climb is just about over and the summit is an easy walk off to the left. We are not alone . 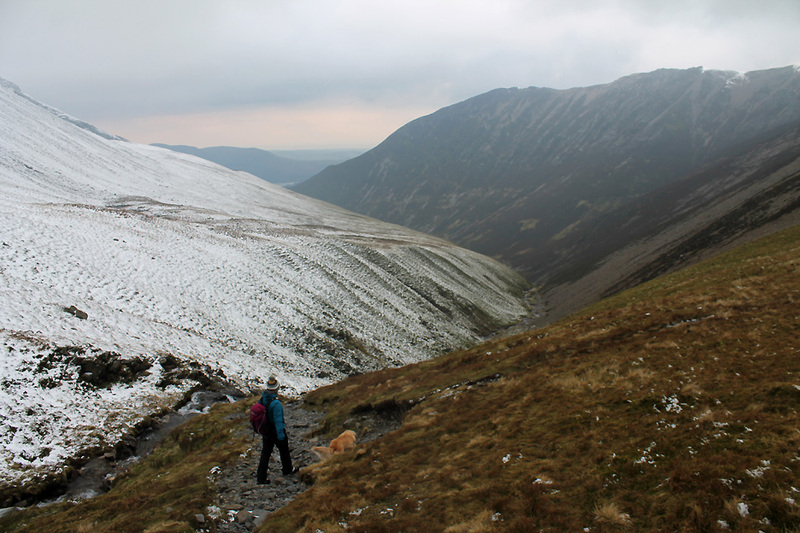 . . two people can be seen walking the ridge after climbing from Coledale Hause. 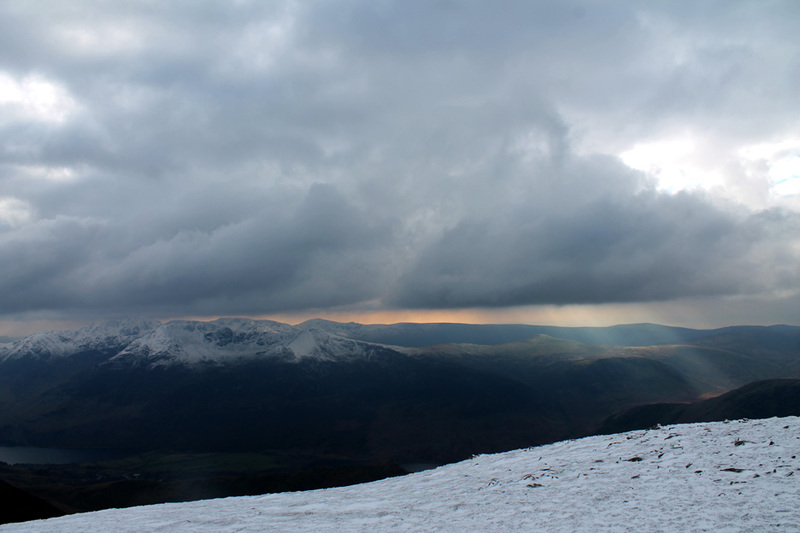 and the white of Eel Crag / Crag Hill is the highest ground . 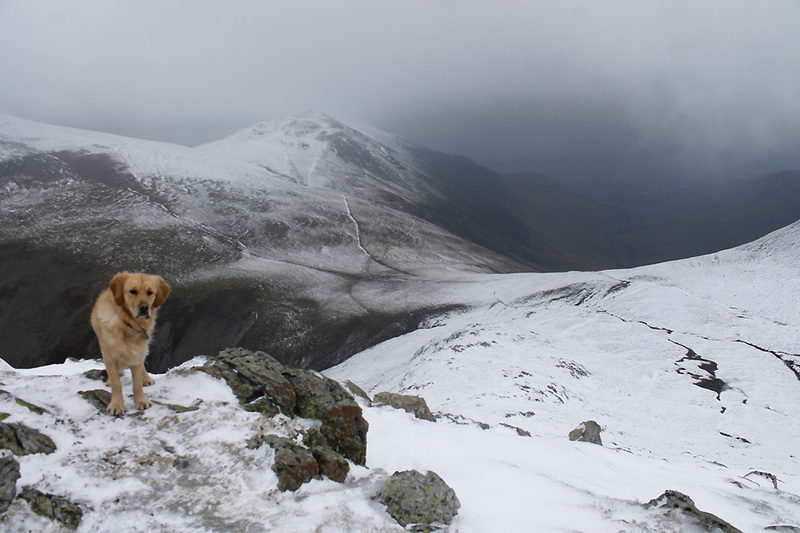 . . almost hidden behind the extended high ground of the Grasmoor ridge. The only other colour in the sky is from the sunshine over the Irish Sea out to the west. 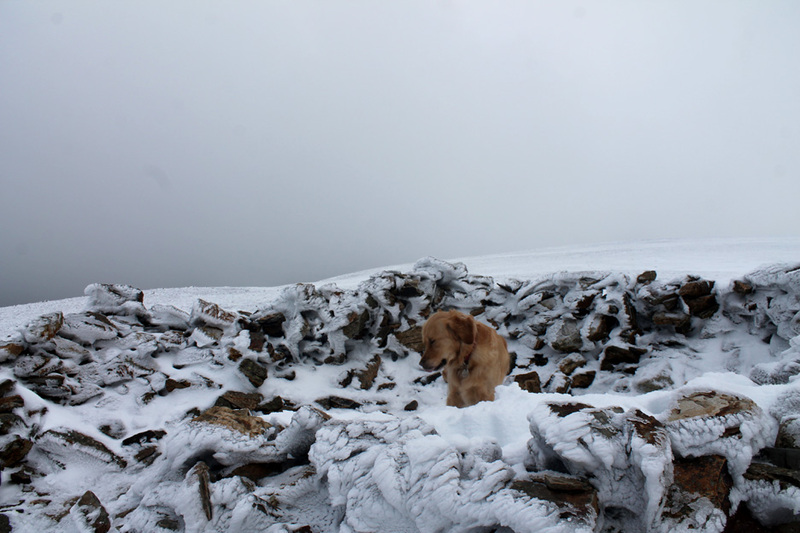 Melted snow and rain has frozen to form a thin layer of ice . . .
. . . but the summit shelter is now only a short distance ahead. 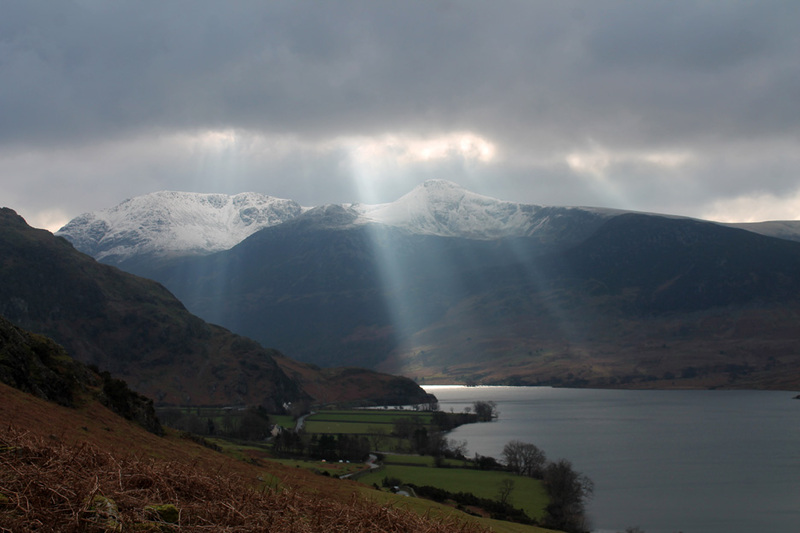 More sun's rays shine down on the Floutern Pass behind Mellbreak. The summit shelter offers little protection today. Dylan tried . . . but after a short time he tended to agree. 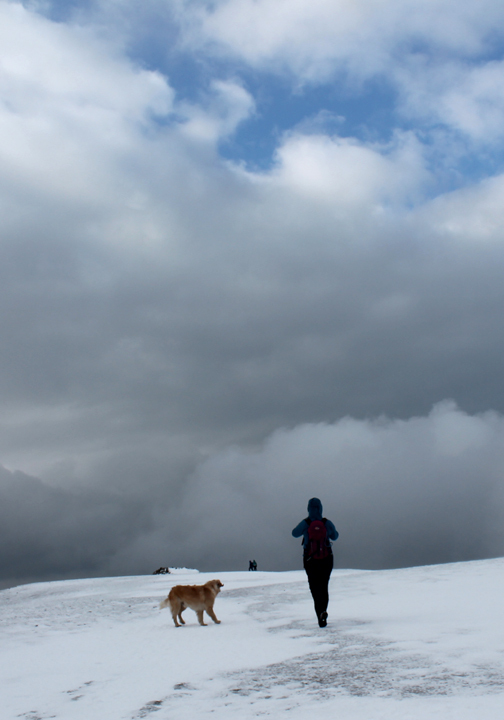 We are not alone on the summit. This kind gentleman took the following photo . 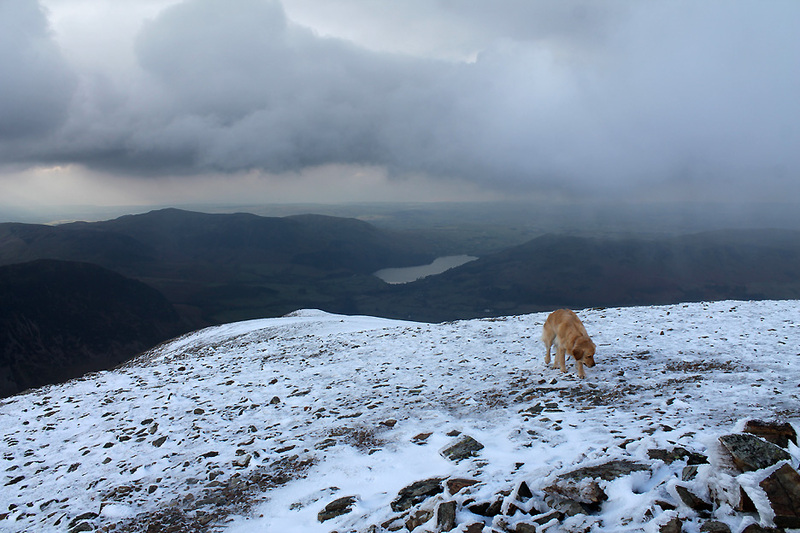 . .
Grasmoor summit . 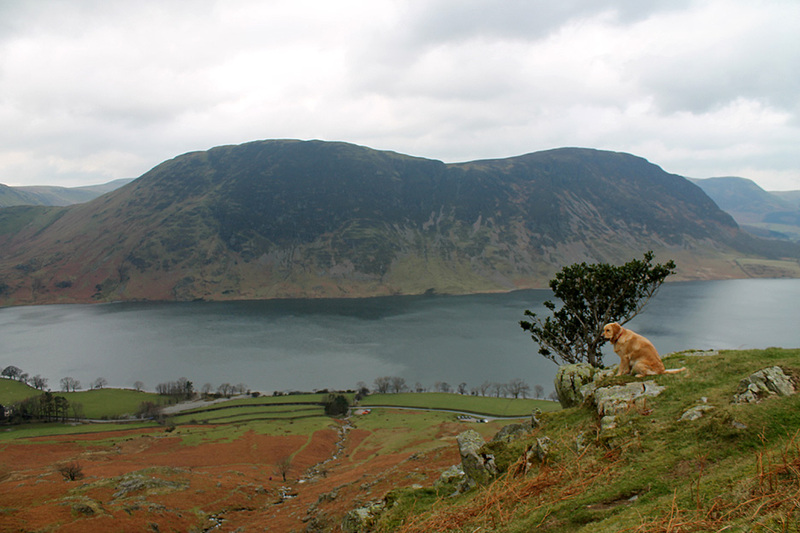 . . another tick for Jenna on her list of fells that can be seen from our Loweswater home. so we walked a short distance down to the next bump to try for the view down into the valley. As we pass the summit on the way back the weather is a little brighter so I catch a quick summit photo. 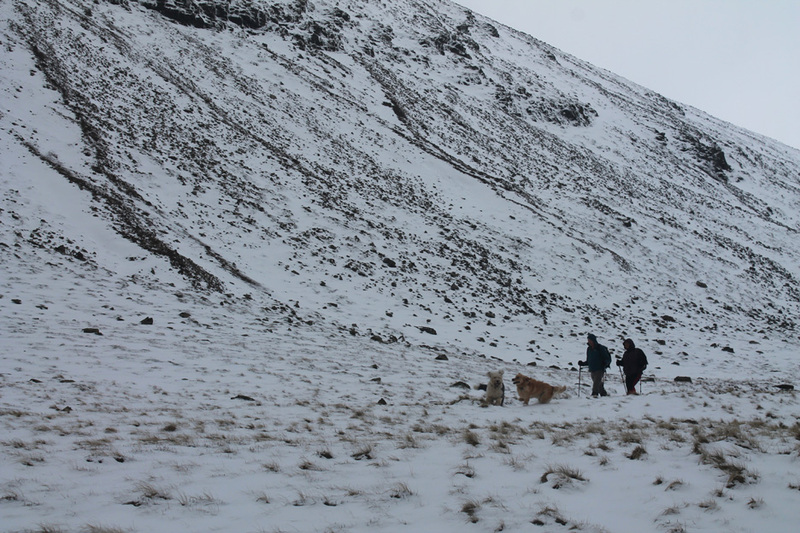 We set off back across the summit plateau . . . initially as far as the Lad Hows path junction. 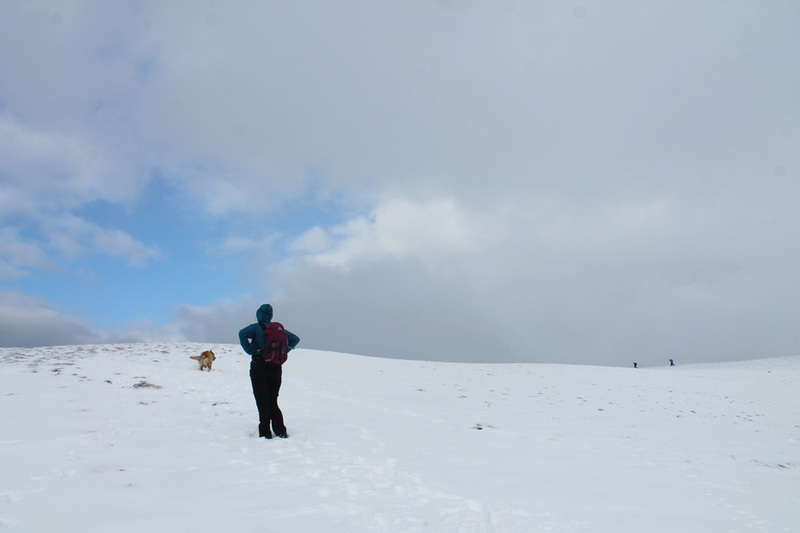 The turn was only visible by virtue of a small cairn, otherwise it would be difficult to find the exact start of the descent in snow. To make a round walk for the day we used this landmark to turn left rather than right and headed up to the higher ground. 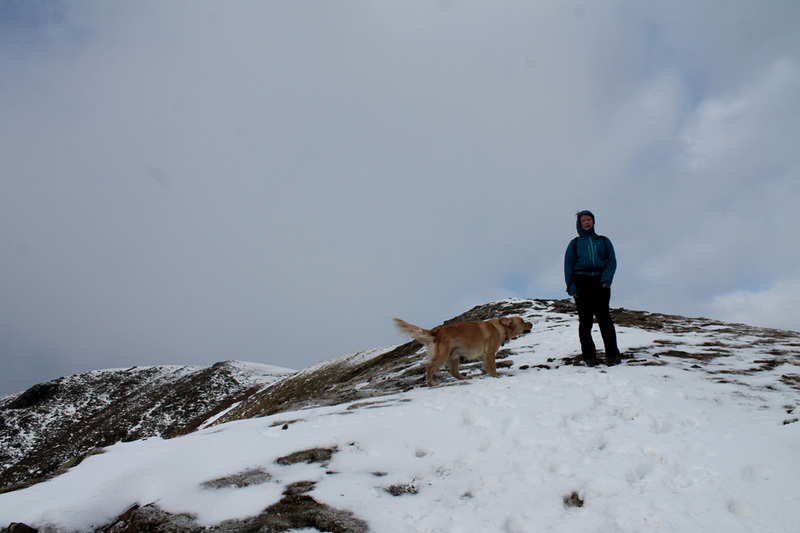 Over the other side of the rounded top we reach the cornice overlooking Dove Crags Cove. 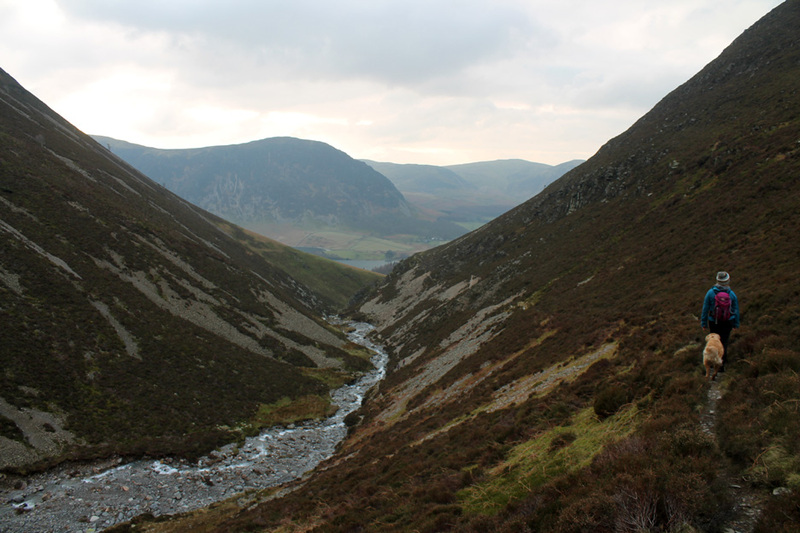 Looking down into the cove and across to the Gasgale Gill Valley. 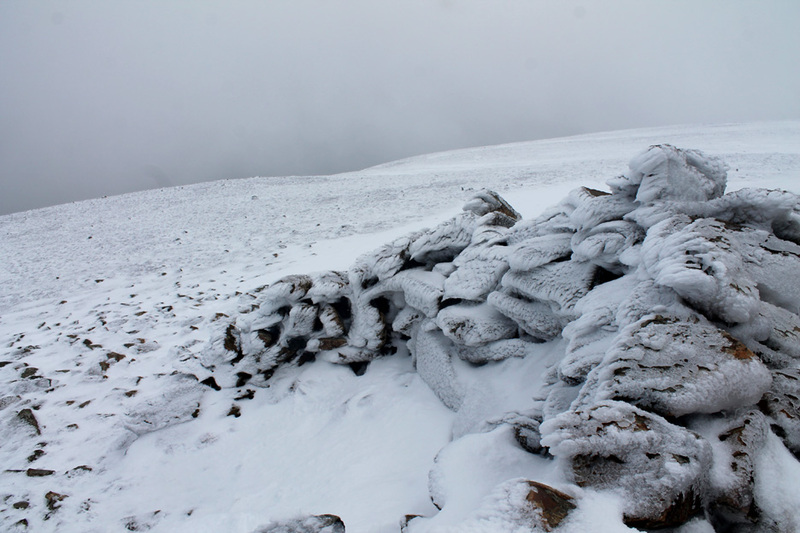 It would be very difficult to spot the cornice and the edge in poor weather or white-out. 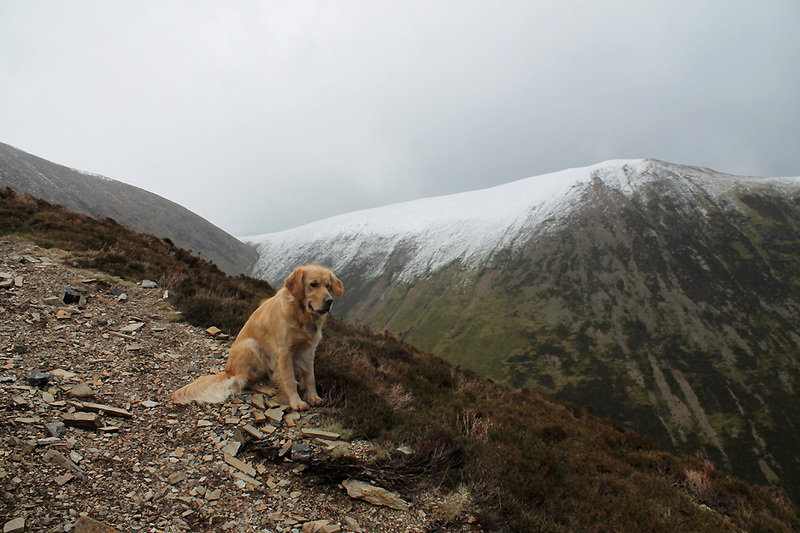 Surprisingly the warmer weather a few days ago has melted much of the snow from the Whiteside ridge opposite. We follow the right hand side of the cove . 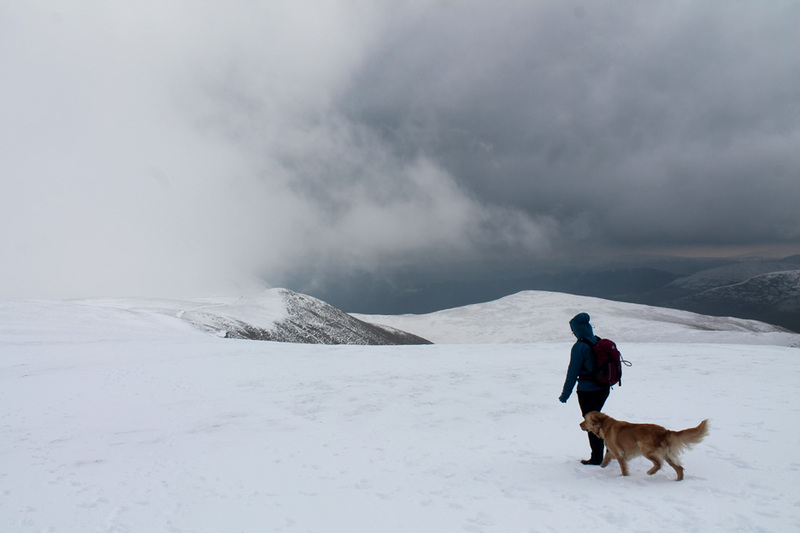 . . aiming down towards Coledale Hause. Ahead is Sand Hill and Hopegill Head with Eel Crag off to the right. 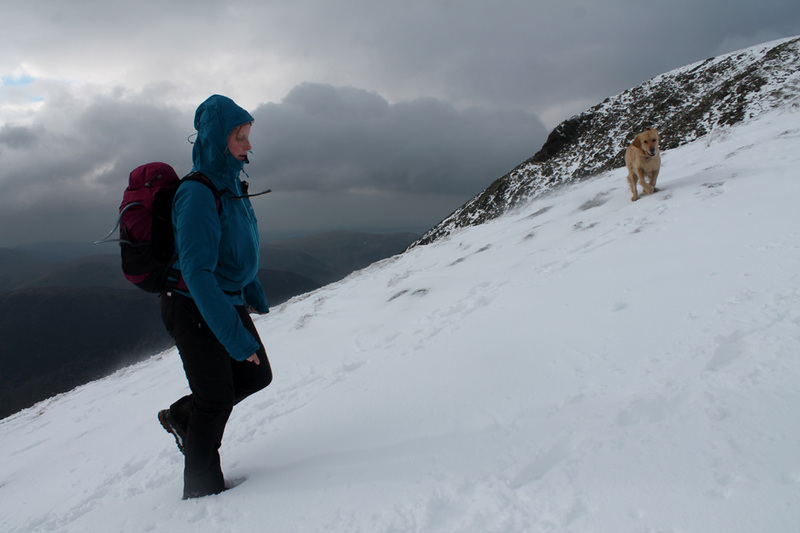 The snow over the ice on the descent has encouraged us to put on the microspikes for better grip. To our left a full view of the steep side of Dove Crags. 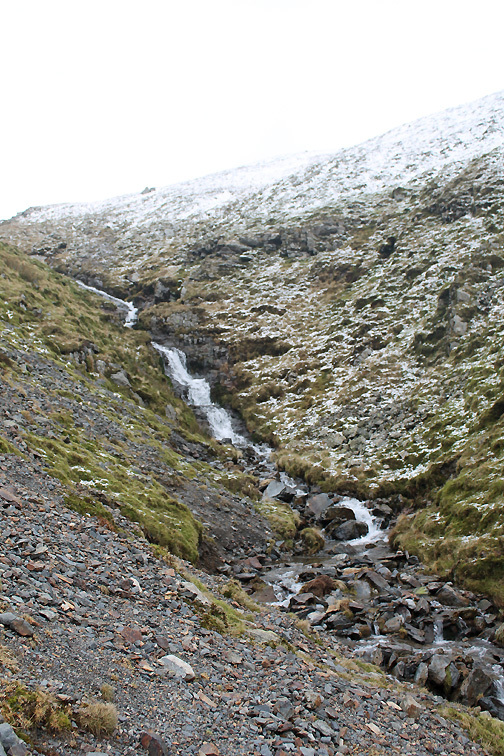 Despite apparent leveling of the slope at the foot of the crags there's still enough slope to prevent a corrie tarn forming in the hollow. 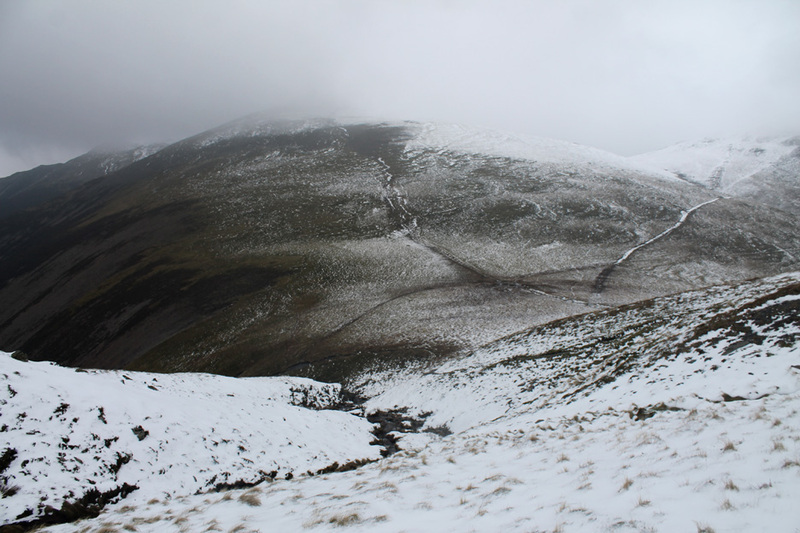 then a single path descends towards Coledale Hause. 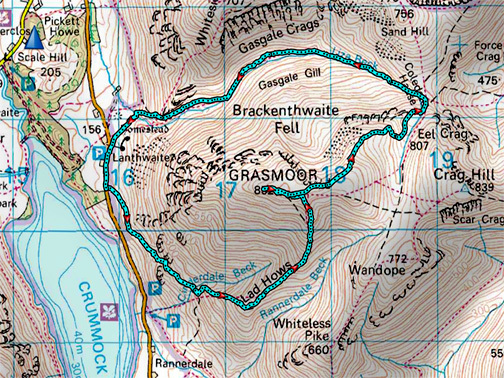 It is well used today with three or four groups of walkers moving up and down. 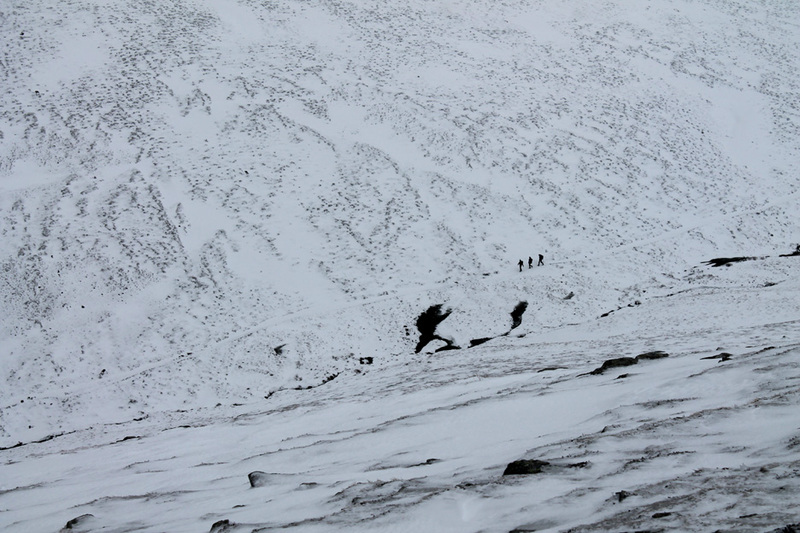 Three walkers moving down the slope . . . . one apparent giant striding up to meet them. 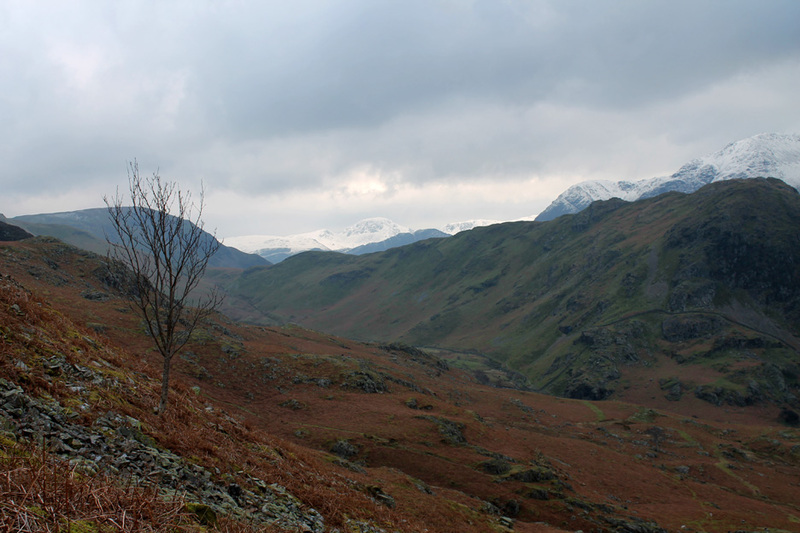 Looking towards the Coledale Valley and distant Braithwaite down there in the gloom. 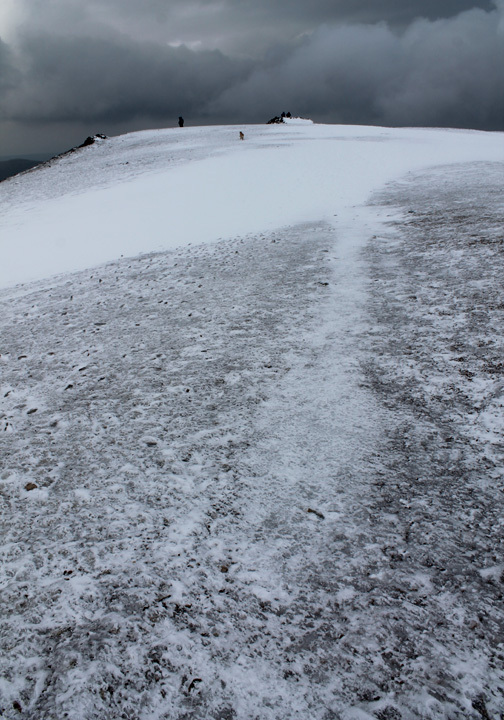 The black and white path heading directly away from the camera leads up onto Grisedale Pike. before we join the main path too. 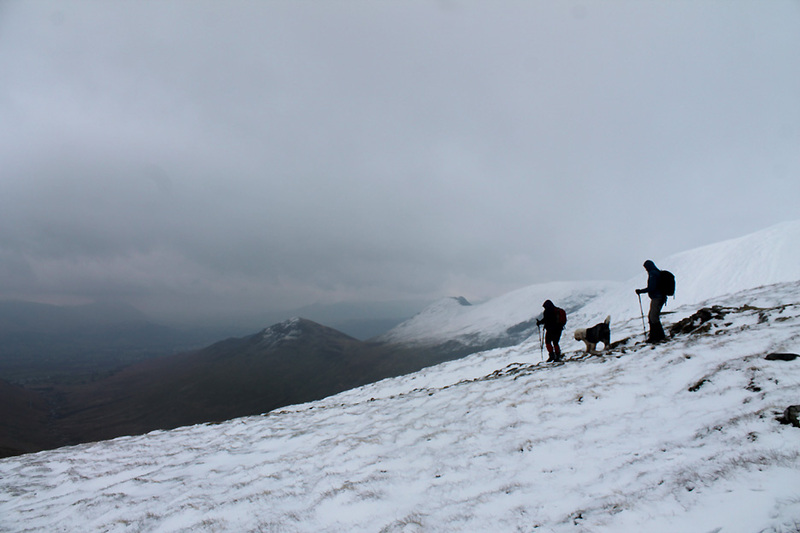 Looking back at our alternative descent route from the summit. 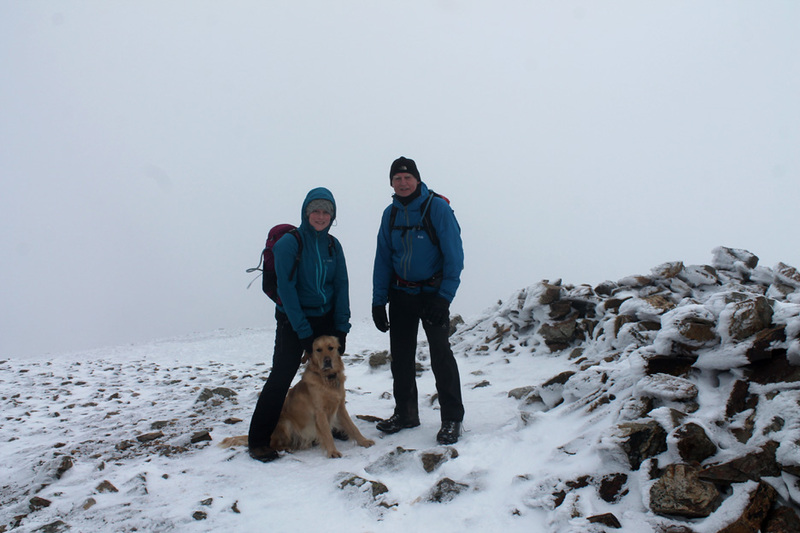 This couple and their large Old English sheep dog have just made a slow descent from Eel Crag high above. 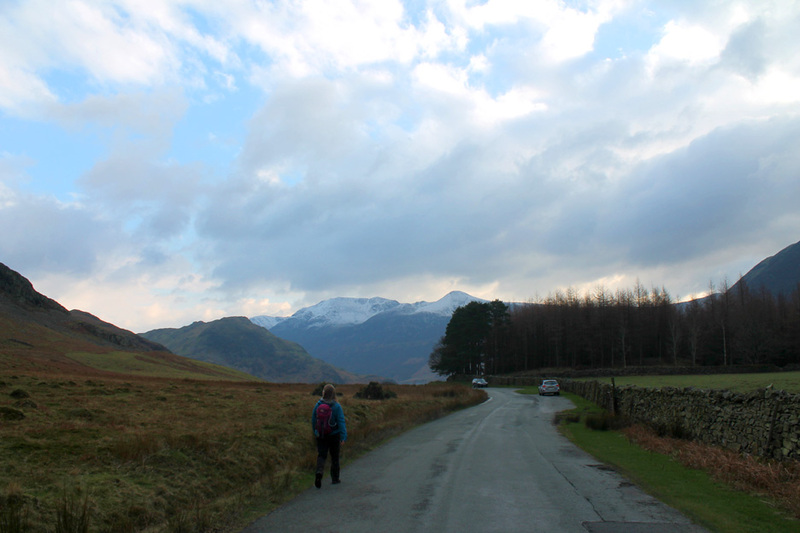 and then they headed off towards Braithwaite whilst we turned down to Gasgale Gill. We look for the path that follows the upper section of the Gill. 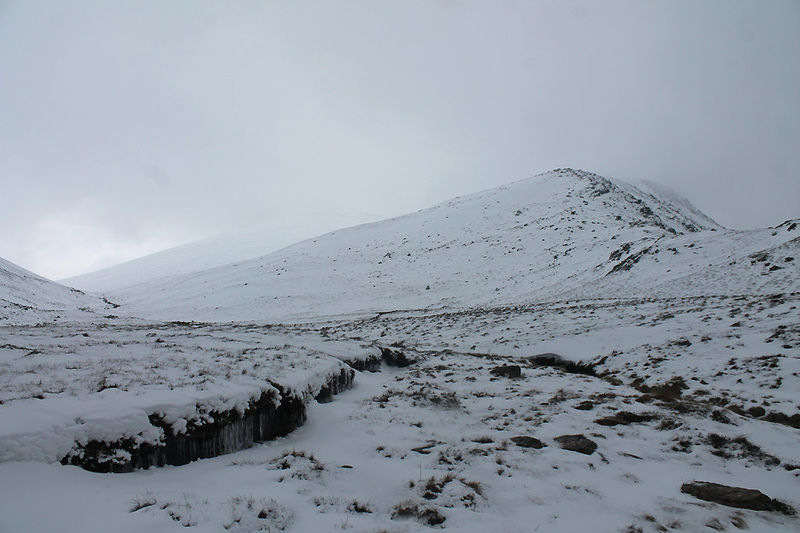 A confusing snow line on this side of the fell. 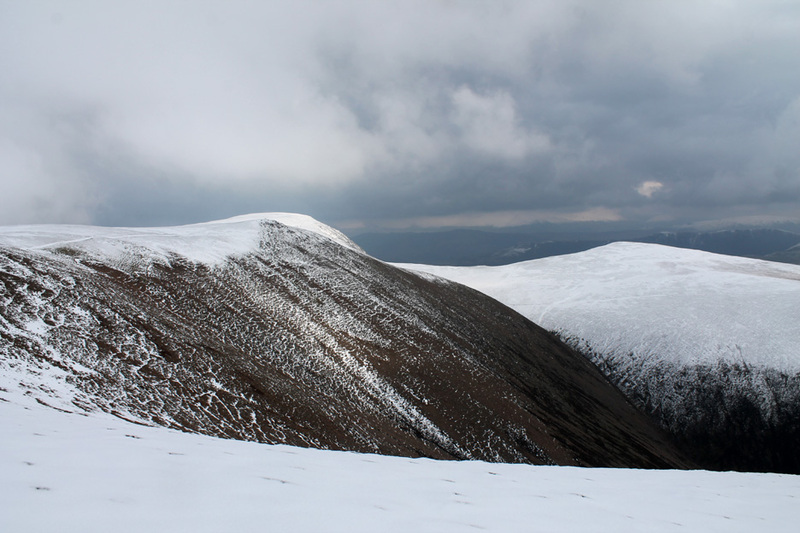 The north facing slope is still snow covered but the higher south facing side of Whiteside has none at all. 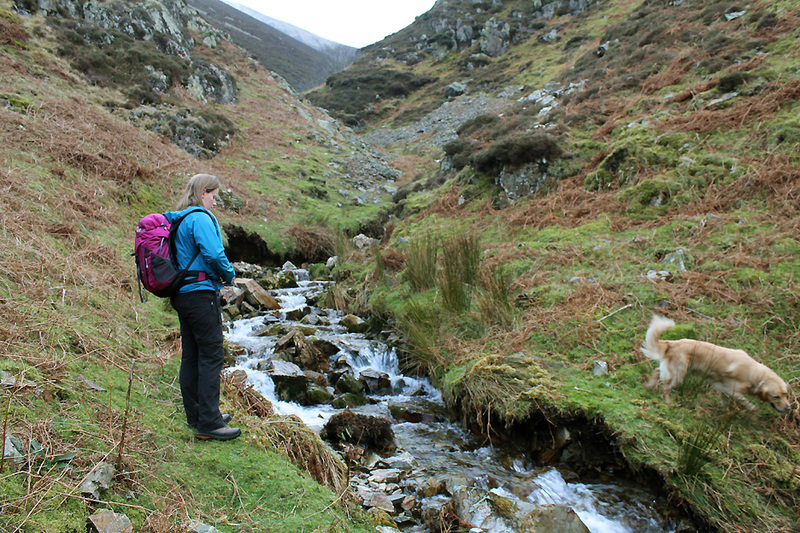 The river starts its cascade into the valley . . .
. . . and we follow the path alongside it. The flooding of recent years has demolished much of the path . . .
. . . so there's plenty of loose gravel in the water course. 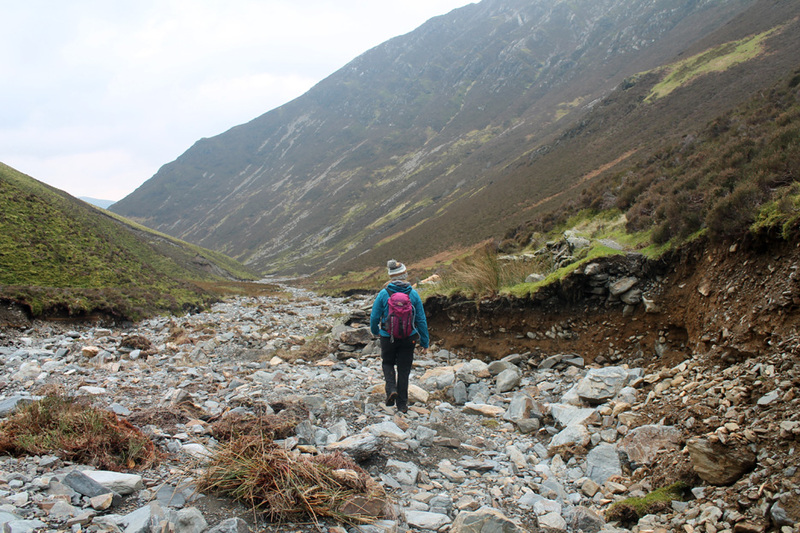 Lower down we take to the stream bed as the path higher up on the left has been totally washed out. 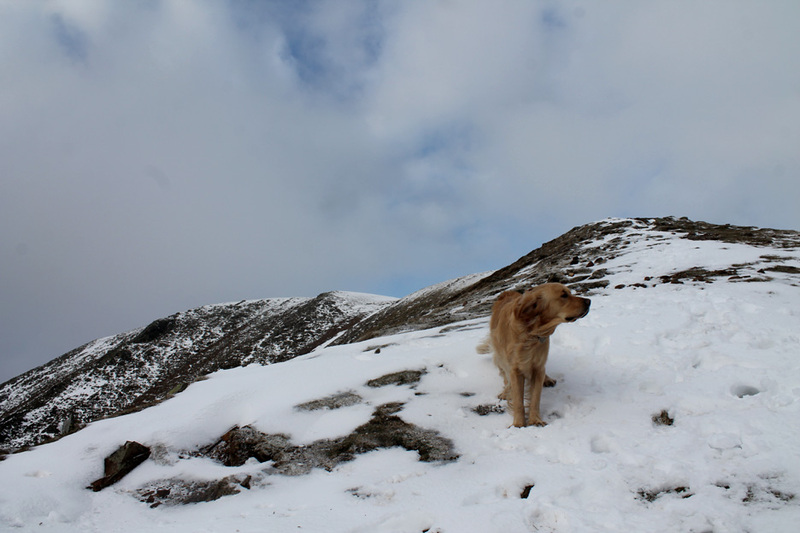 Knowing the lower path is also modified we stick to the high ground towards the bottom end of Whin Ben. 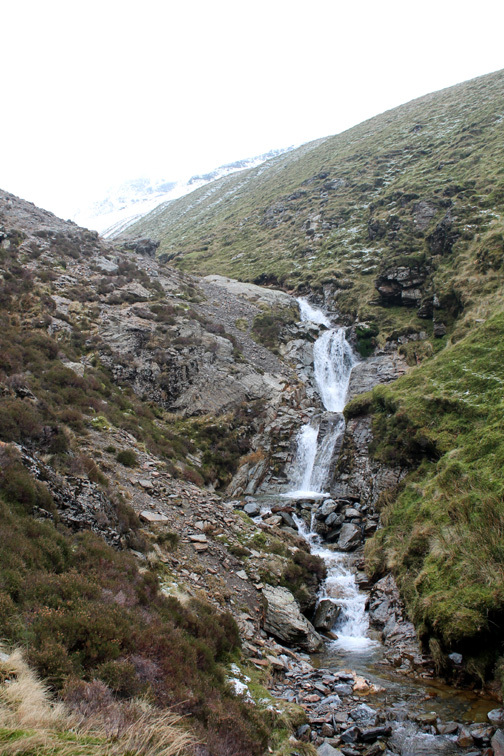 The turning can be found just up from the large rock below us alongside the stream. No wonder there's so much gravel in the main valley as there has been a huge amount of erosion up here. 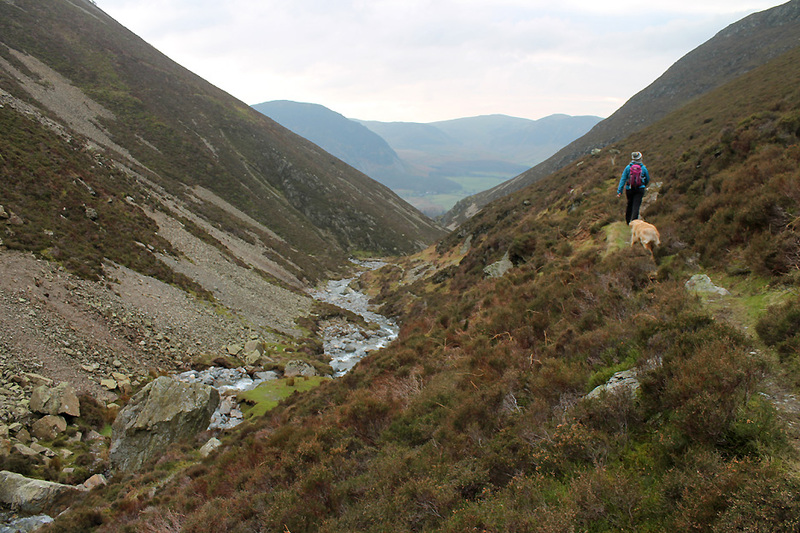 Over the lower part of the fell and onto the Whin Ben path . . . we're heading down into the green valley once again. The car can just be seen as a bright dot by the trees on the left, just before the road drops to the lake side. 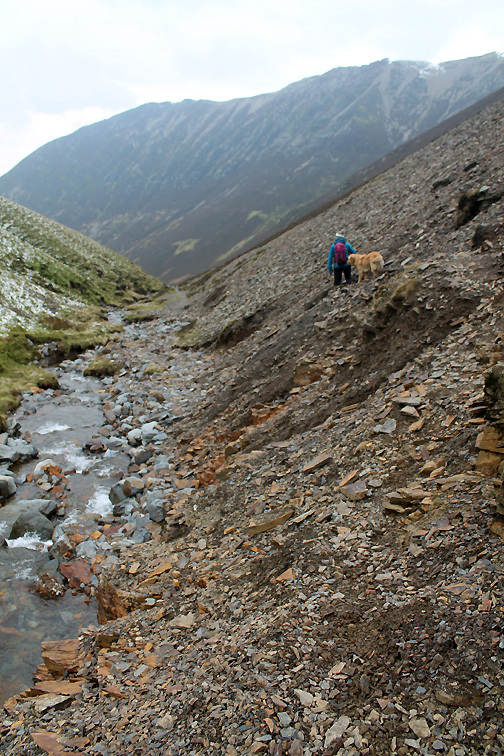 The short road walk rounds off a fantastic walk on the wilder side of Grasmoor. This site best viewed with . . . a new windproof coat for Jenna.